Reduces the number of steps by rooting and adding in the same step. Keeps to an absolute minimum, the need to compare sizes, because Dyscalculia makes this challenging. Uses a mnemonic to recall the steps. Normally in a problem involving Pythagoras, you are given 2 of the sides of a right angled triangle and asked to find the third. You need to Root the Add of the Squares (R.A.S, end of PythagoRAS). Always key in the larger number first…. 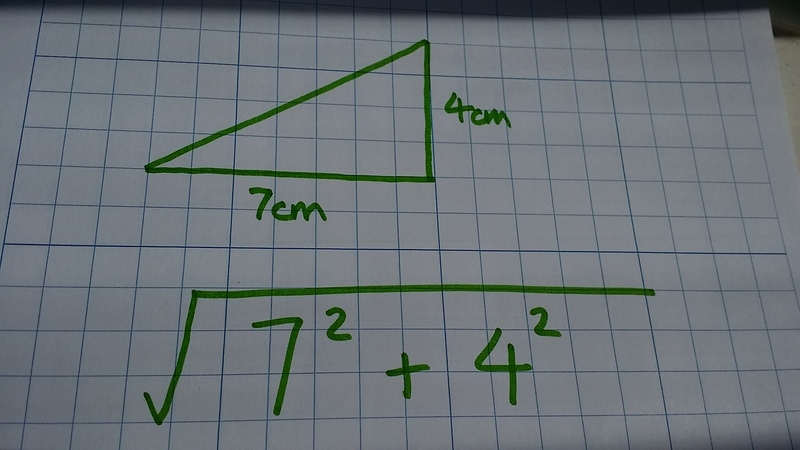 This will give the answer 8.0622..
but Perhaps You Takeaway (PYThagoras) so mouse back to the plus (+) and change it to a take away (-)… and this gives 5.7445..
Now it’s decision time – using the picture, which answer looks most sensible, 8.0622 or 5.7445? The length of the 3rd side in this example is clearly longer than 7 so the correct answer is 8.0622.